will be playing at Legends Bar & Grill this Friday, June 30 (see info below)! and Outtasite with Sir Mix-A-Lot. The trio is rounded out with Michael Johnson on guitar and vocals. As soon as we heard that front row reserved seating would be available on Thursday for this Saturday performance, we decided that a spur of the moment road trip from Detroit was going to be doable. The Burke Airport was only a short distance from the Rock n Roll Hall of Fame, and I marveled at the giant sculpture of a rubber stamp that said FREE in letters printed backwards as we passed by. You couldnt ask for more perfect weather that night. The stage was set up right beside the racetrack, with bleacher seating on the other side to accommodate a crowd of around 2,500 or so. There was a slight problem with the reserved seating being placed 50 feet from the stage, but it soon went away. To make a long story short, it took the fans about 3 seconds to abandon their chairs when Paul first appeared on stage. After about 10 more seconds, hundreds of people had safely made their way up front, and Paul had his audience close to him where huge smiles would be exchanged and handshakes would be plentiful throughout the evening. The highlight of the performance for me was hearing Simple Man performed for the first time. I love everything about that song and effect that its timeless quality has over me. There was a beautiful sunset occurring behind one corner of the stage at the halfway point of the show, and the fresh smell of the summer air coming off lake added another dimension to make the night unique. As people were getting into in a singing mood, the most humorous moment of the night came when Paul realized that the audience could only recall a few words to the Hendrix songs. He started joking with us about how good we sounded, and then began motioning towards to the sky to give us some clues. It reminded me of how a teacher will drop hints to the class to help the students arrive at the right answer to a question. It was just hilarious to discover what a short attention span everyone had and how un-teachable we were at that particular moment. The audience soon made up for it during the Bad Company numbers that followed, coming through loud and clear with all the words this time, and finally revealing what a true blue PR crowd sounds like. Just the same, I hope that Paul keeps these beautiful Hendrix songs in the set even if he has to sing them by himself!! Here is the set list for what became a very successful two-hour show. Like the recent Queen performances, the time went by far too fast. PAUL AND THE BAND WERE IN GREAT FORM. HOW FITTING THAT PAUL WAS PERFORMING RIGHT NEXT TO THE ROCK AND ROLL HALL OF FAME. BECAUSE THIS GUY DESERVES TO BE INDUCTED ASAP. VARITY OF SONGS FROM MANY OF THE BANDS HE WAS A PART OF. MY FAVORITE BAND, FREE WAS REPRESENTED WITH FIRE AND WATER. THIS INCLUDED A WONDERFUL DRUM SOLO BY JEFF KATHAN. MY HAT IS OFF TO JEFF. AND SOME COVERS OF THE BEATLES AS WELL. FIRST TIME I HEARD THEM PLAY BAD COMPANYS SIMPLE MAN. WHAT A GREAT SONG LIVE ??? AS WELL BY PLAYING ACOUSTIC GUITAR AND PIANO ON VARIOUS SONGS. HIS FACE WHEN PAUL PERFORMED LITTLE WING IN SUPERB FASHION. NOBODY CAN SING THIS SONG LIKE PAUL. LYNN SORRENSENS BASS PLAYING WAS EXCEPTIONAL. ESPECIALLY ON ALL RIGHT NOW. 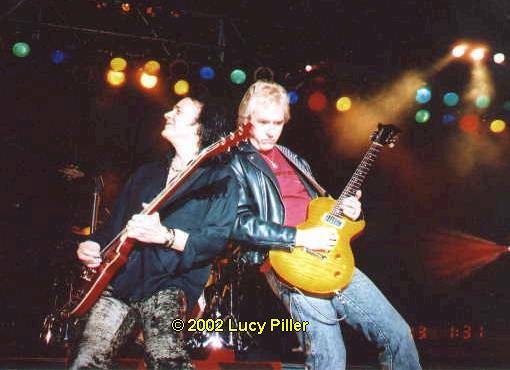 HOWARD LEESE WAS EXELLENT AS WELL. HOWARDS GUITAR PLAYING WAS ROCK STEADY. THESE GUYS ARE EXCITED TO BE PLAYING TOGETHER AGAIN AND YOU CAN TELL. I HEARD THEM 3 TIMES BEFORE PAUL WENT ON THE ROAD WITH QUEEN. THEY DIDNT START WHERE THEY LEFT OFF. I HEAR THEY ARE OFF TO JAPAN. I WANT TO HEAR MORE!!! Tickets are priced at £15 in advance or £16 on the door. Please get in early for your tickets as this is due to sell out. legendary actor/racer Paul Newman and racing legends Bobby Rahal and Al Unser Jr. The event will take place on Saturday, June 24 at 12:45pm at Burke Lakefront Airport. Children's Hospital through Cleveland Grand Prix Charities. 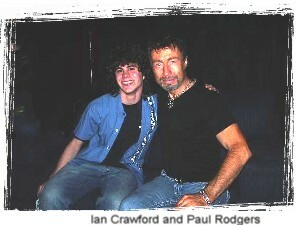 Some premium tickets for Paul Rodgers' Cleveland concert. opportunity to sit right in front of the stage. $35/ticket, and fans will sit right in front of the stage (so first few rows). sometime in July in our ARN CHAT ROOM. News Exclusive to ARN !!!! getting a record deal after the record was recorded. Paul Kossoff. Paul was trying to get a new band together. came to the door and actually Stevie recognized me right off the bat . of wine, and a good time was had by all. The Rocktologists (Steve and Paul) WKRB 90.3 FM out of Brooklyn, NY. AMERICAN MINOR come storming onto the music scene with their own brand of 70s rock.!! These guys have released a great debut album that is definitely worth checking out. To hear AM is to hear the past come alive. !!! Their focus on bluesy, riff heavy tunes is refreshing to hear. The best retro acts are the ones that can use their influences to create a cohesive band, and AM does that. They definitely know how to Rock-out loud !! Go see them LIVE and you will see what I mean." 19th july, the full moon, newcastle under lyme, stoke on trent. 4th aug, the railway, middleton, manchester. 19th aug, the barleycorn, barley moor road, west didsbury. 26th aug, the railway, middleton, manchester. 2nd sept, hark to towler, tottington, bury. 22nd sept, uncle jacks, darwen, lancs. 29th sept, the railway, middleton, manchester. 28th oct, top spot,hindley, wigan. 18th nov, the glass barrel, atherton, bolton. sat, 25th nov, the griffin, newton le willows. - It is available in Japan only so is on NTSC format. 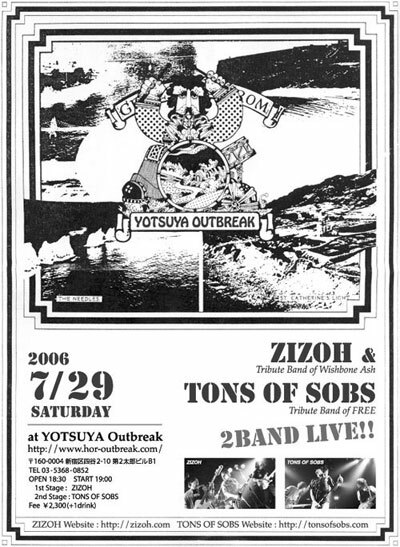 - It is a live recording from the Saitama Super Arena in Tokyo from October 2005. - It will have Japanese subtitles and Japanese text on the outside of the packaging. Mike Lowry is The Total Package!!! He brings to the stage years of experience in his high energy show. allowing Mike to put together a dynamic band, bringing down the house with every performance. The release of his new CD has put him on the road performing throughout the Southeast. Skeeter Brandon, Cigar Store Indians, Jimmy Thakery, just to name a few. stage and so reserved and poised off stage. His talents seem so natural and effortless. Full of assurance, Mike is very confident in the direction he is headed  UP! Atlanta's most intimate outdoor musical event featuring nationally acclaimed musicians. the fourth-annual series will be presented in June, July and August on the Great Lawn. A concert on the Great Lawn. Rock and roll used to be about plugging in, turning up and letting go, but as rock has aged and changed that simple formula seems to have been forgotten for the most part. Unless you ask KING KARMA, a band fast becoming one of the most talked about new groups in the current resurgence of rock music! Built upon the solid foundations provided by rhythm section TODD RONNING (bass) and RICK FEDYK (drums), KING KARMA's music is a gorgeous amalgamation of hard rock guitar riffs and introspective acoustic passages. Guitarist, MARKUS WOLFE succeeds, where many more famous names have failed, in that he plays with true feel and purely for the song, rather than simply to show his undoubted technical ability. To round out the line-up there's vocalist SHAUN WILLIAMSON, a man with more soul and raw emotion in his voice than a recording studio full of Boy Band Wannabes and Pop Idol hopefuls. Paul Rodgers - Saturday, June 24th at 8:00 p.m.
Bad Companys Paul Rodgers is one of rock's most respected singers and songwriters who for years has been known by media and fellow musicians as The Voice. Imbued with equally generous measures of swagger and soul, his legendary voice has been shining its light for almost four decades and as a songwriter he has left a deep impression on rock music. musician is a force. No other artist has led three bands to global success as Rodgers has with "FREE", "BAD COMPANY" and "THE FIRM" in addition to a Grammy nominated solo career. Rodgers is also fresh off of a year-long tour with Queen where he performed songs made famous by the late Freddie Mercury along with original members of Queen. singers and songwriters who for years has been known by media and fellow musicians as The Voice. Imbued with equally generous measures of swagger and soul, his legendary voice has been shining its light for almost four decades and as a songwriter he has left a deep impression on rock music. Chizuko, Paul, Susie and Yoko at the Cabazon show CA. THIS WAS A GREAT SURPRISE TO SEE JUST BEFORE GOING OFF TO BED TONIGHT !!!! Band members Paul Rodgers and Simon Kirke stopped by the VH1 Classic studio to talk about their recent DVD entitled, "The Merchants of Cool." Video clips include"Good Lovin' Gone Bad," "Joe Fabulous," "No Smoke Without A Fire," "Seagull," "One Night" and "Deal With The Preacher." Get a closer look into an artist's style and evolution with a block of an artist's video clips accompanied by an exclusive new interview with the artist. Click on Artist Name to go to artist page. Click on TV icons to search the TV Schedule for selected Artist. The voices you'll remember... the songs you'll never forget! 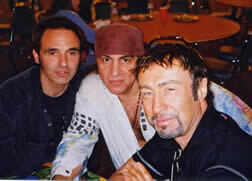 Lynn Sorensen (bass) and Joe Shikany (guitar) and Jeff Kathan (drums)who tour with Paul Rodgers...the voice of Free, Bad Company, and The Firm...in Paul's solo band. Produced by Tony Franklin. Written, Arranged, Recorded and Glued Together by Tony Franklin. The Greene Room, The Leopard Room B and Heartsound Studio, Los Angels, California. Additional Mixing by Marc Greene at The Greene Room. Additional Engineering by Marc Greene. Mastered by Brad Vance for Red Mastering. Few bassists over the past two decades are more synonymous with the fretless bass than Tony Franklin. In January 2006 - Fender proudly introduced the new Tony Franklin Signature Model Fretless Precision Bass® guitar. numerous sessions and Franklin's own successful solo career. Fred Holzman and Joe Shikany to host a Sunday jam night in Seattle. become one of the area's favorite 3 piece bands. Lloyd Debarr is the lead guitarist, lead singer and front man of N'Sane. Lloyd became a fixture in the Seattle nightclub circuit as the guitarist for The Newsboys.
. Lloyd also is the front man of Crosswalk, who are currently finishing their first album. his singing and outrageous performance. He also works with The Davanos and PowerCell. You will never forget Freddy!! to use as the bass player of N'Sane. NSane delivers music, fun and craziness from start to finish.
" Dates now available "
STURGIS 2006 on the SAM KINISON MEMORIAL STAGE (K). HOT NEW BAND ON MY LIST !!!! LISTEN LIVE ON THE INTERNET !!!! Jemfest is an organization which benefits Make a Noise Foundation, a charity founded by Grammy Award-winning musician Steve Vai. Make a Noise Foundation provides musical instruments, musical education, and musical culture to young musicians who can not afford to do these things for themselves. All funds raised by Jemfest raffles are directly donated to Make a Noise Foundation. founder of of "Bad Company" and formerly "Free"
Watch out for their name !!!!! Celebrating the release of "2 of 5" in the ATL! Mike Martin is one of the most innovative musicians to have hit the music scene in a long time. ranging virtually every genre of music. Mike is releasing his debut instrumental rock fusion cd "2 of 5" June 2006. You need to see Mike live to believe what you hear. well as photos from his own collection for the 20 page CD booklet. 1. Live For The Music 2. Good Lovin Gone Bad 3. Deal With The Preacher 4.
out gigs across America. On this tour they played to over a million fans at 52 concerts in 70 days. several massive venues in Florida and Alabama as well as selling out Madison Garden within a day! had been one of the swiftest ever. personal archives as well as photos from his own collection for the 20 page CD booklet. All Shirts are Fruit of the Loom. During the seventies the double live album was almost de rigueur amongst the major rock artists of the era. Lets face it how many double live albums from that era can you name. Live and Dangerous, Strangers In The Night, Seconds Out, Rockin The Fillmore and the daddy of them all Frampton Comes Alive so surely Bad Company must have released one; didnt they? Well the simple answer to that is actually no they didnt. Yeah I know, one of the biggest bands of the seventies Bad Company did not release a double live album. Reading the sleeve notes of this absolutely amazing live album Mick Ralphs cant explain it either other than to say the band were virtually prisoners of the album tour album routine that many bands were prone to in the seventies. This stunning live album recorded during the early part of the Run With The Pack tour sets the record straight and despite the fact that it is thirty years late makes no difference to the enjoyment you will derive from this recording. The original line up of Bad Company were something to behold in the live arena and if you missed them and wondered what all the fuss was about now would be a good time to sample just what it was that made this band so successful and what the Americans took to their collective hearts as here on this album is all the proof anyone could ever want. You have to understand that by the time Bad Company released their third album Run With The Pack the band really were at the top of their game. They had the songs they had the moody image and more than anything else they had one of the worlds greatest front men in Paul Rodgers. 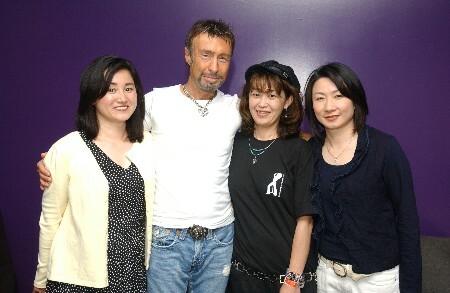 That isnt to demean or downplay the other members of Bad Company or their part in the story because Boz Burrell, Mick Ralphs and Simon Kirke were and indeed remain excellent musicians and they provided the musical muscle that enabled Paul Rodgers to strut his stuff and front this wonderful band. In terms of material the Bad Company set at this time featured the tried and trusted material from the first two albums (Bad Co. and Straight Shooter) with Bad Company, Cant Get Enough, Seagull, Deal With The Preacher, Good Loving Gone Bad, Feel Like Making Love, Shooting Star and Ready For Love. Put these tracks alongside Live For The Music, Simple Man Young Blood, Honey Child and the title track from Run With The pack and it is easy to see just why this band brought audiences to their feet on the tour that spawned this recording. In effect this album is a live Greatest Hits and I am in no doubt that if this album had come out in say late 1976 it would be revered as one of the great live albums of all time. Yes it really is that good. They do say that all good things come to those who wait and while the wait has been interminably long it really has been worth the wait. For those fans for whom Merchants Of Cool was close but no cigar this album will certainly stand as THE definitive Live bad Company album and I urge you to check this out for yourself. You know you want to. 11. Learning something from every person you meet is a choice not a chore. 10. The door man of today could be the guy you have to negotiate with down the road. 9. The most important ingredient in any business is communication. 8. 30% of everyone hates everything so just focus on the other 70%. 7. It doesn't matter how great you are if no one knows you exist. 6. If the result doesn't outweigh the effort, rethink the effort to get the desired result. 5. Never measure your worth against the value of others. 4. There is no such thing as a stupid question when you are learning a business like music. 3. Don't be as opinionated as the last opinion you heard. 2. All artists have 2 common similarities, they are creative and insecure. THE #! MUSIC BUSINESS PROVERB is; No one ever learned anything with their mouth moving. not only will your career improve, but you will be amazed at what it does to your quality of life! So, what was your favor number?